We are about 10 minutes from either junction 3 of the M3 or junctions 10 or 11 of the M4 we are very easy to access for you and your customers. Driving Directions From the M4 Motorway (London). Leave the M4 at J10 and follow the A329(M) signposted Wokingham and follow all of the signs into Wokingham. Once you are on the 'one way' system you will find in front of you the Town Hall and you need to take the road to the left (A321 - signposted Sandhurst). Head out of Wokingham for about 2 miles (passing the Tesco superstore and the 'Two Poplars' pub) until you arrive at a roundabout with a Ford car dealership called 'Inchcape'. Here you need to turn right (signposted Finchampstead) following this road, straight over the first roundabout and up to a second set of roundabouts with some shops etc. Here you need to turn right onto the Nine Mile Ride and you will find us about one mile on the left, just past California Country Park. Driving Directions From the M4 Motorway (Newbury). Leave the M4 at J11 and once you are on the roundabout, take the second exit signposted Arborfield. Follow this road for about one mile until you come to another roundabout and take the third exit, again signposted Arborfield (A327). Follow this road for half a mile to a roundabout and take the 1st exit (still signposted Arborfield). After about one mile you will arrive at another roundabout here you need to take the third exit. You will then drive through the small village of Arborfield and out of the other side. 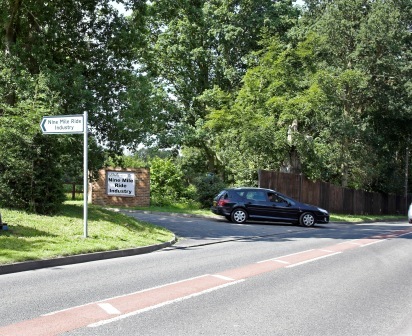 When you reach the roundabout on the other side of the village, take the first exit (signposted Arborfiled Garrison) and immediately after only 100 meters turn right into Biggs Lane (also signposted Arborfield Garrison). Follow this road for about a mile and once you take a sharp left hand bend you will then be in the Nine Mile Ride (the road in which we are located) and we are along there about half a mile on the right hand side. 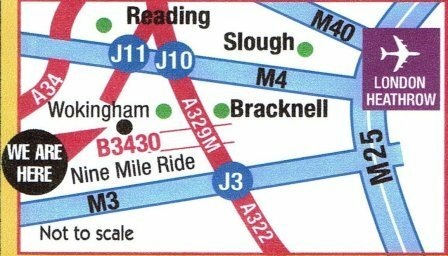 Leave the M3 at J3 and take the third exit signposted Bracknell (A322). Follow the dual carriageway for about three miles (following the Bracknell direction) until you arrive at a roundabout (this roundabout has the Coral Reef waterpark on it) and take the first exit (signposted Finchampstead). You are now in the Nine Mile Ride (which is the road that we are on) and you need to follow this for about five miles. 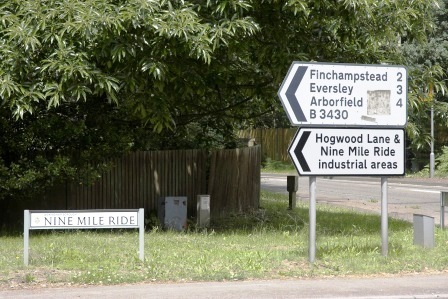 You will go over various roundabouts etc but DO NOT TURN OFF, firstly follow the signs for Finchampstead and once you see arborfield signposted, follow this instead. After passing some shops (Bobs Fish & Chips and Cresswells Garage) continur straight on (still signposted Arborfield) and you will find us on the left hand side just after the California Country Park.